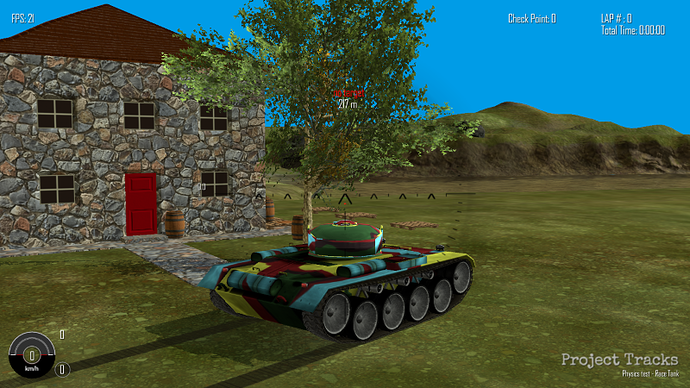 This Project started in 2014 from a challenge to myself in doing real-time movable tank tracks in Blender Game Engine. I intend to make some updates to this thread regularly so you may want to subscribe to it. 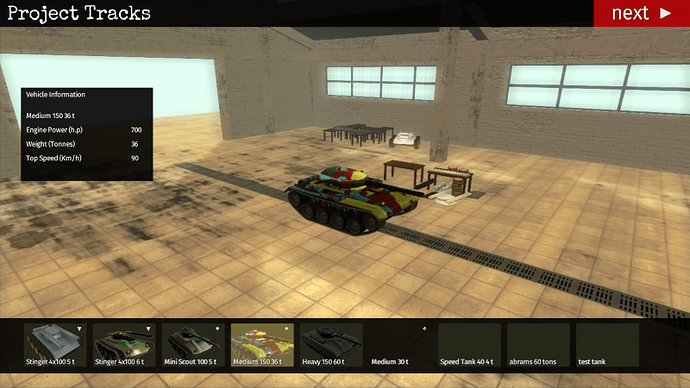 For today, I leave 2 images showing the evolution of the tank models and some work in progress. 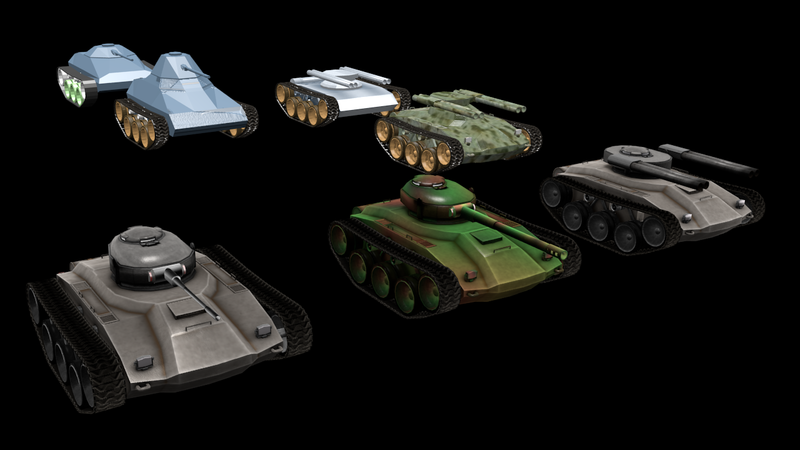 The 1st model was actually a slate box with some spheres as wheels but these are just some of the tanks I worked on since I put some tracks finally working and the last one was the race tank Left Bottom corner. 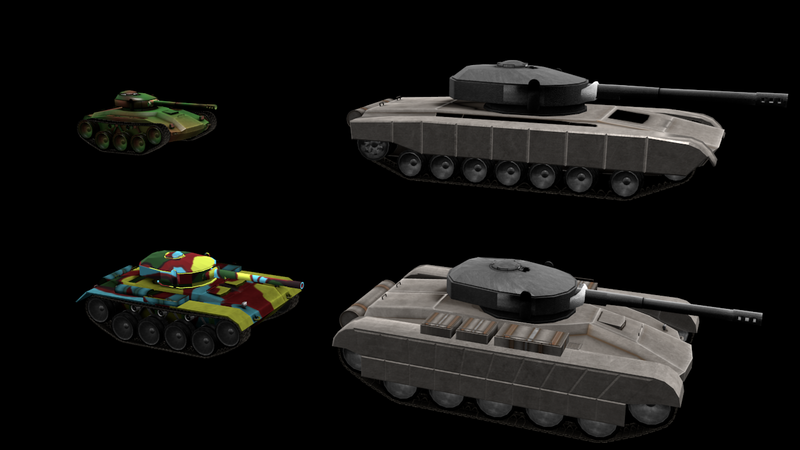 Based on the last model of the Light tank, I’m now working on some bigger tanks so these models are WIP but they already have physics and work well on the maps. With mass of 5, 36, 60 and 100 tons and engines of 150, 700 and 1500 horsepower I’m testing different variations of the engine and gearbox. The idea is to have an unified system of engine, gearbox, suspension that adapts to the specifications given like mass, horsepower, number of gears and engine type. I’ll make a video next time exposing this variables and showing the differences. This is awsome! Great work! hope seeing more development posts! How did you make the suspension? Rigid body joints? I am actually trying to accomplish this but I haven’t managed to do it. I’ve tried several methods to create a vehicle suspension from rigid body joints, constraint actuators, forces with logic brick or python and probably a lot more just to get to a conclusion that what works best is using either the vehicle wrapper or a similar method with python using raycast. cons: the down side of using rigid body constraints is that “they are rigid bodies”, not soft bodies, so you can’t really control the wheels at high speeds as they become unstable and too bouncy, also the constraints are very dependent on the mass of the rigid bodies you are applying them, creating a very unpredictable behavior. pros: the most efficient method I found to use in blender game engine very few cpu usage, decent behavior. cons: Complex to setup, at the moment you have to use lower than reality mass, usually below 300 or thing can go weird, and the worst for me was that I couldn’t find a way to keep the vehicle still while in a slop if I stop the vehicle, it tend to slide even with brakes on. Still there are very nice uses for this method like this example. 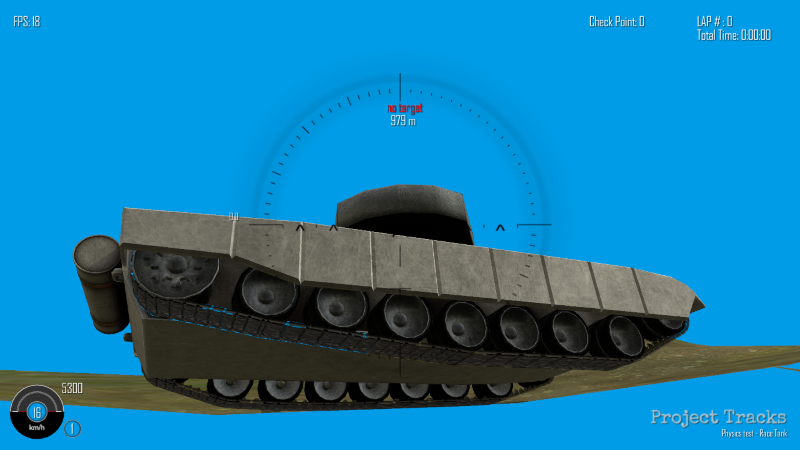 By the way, thanks Raiderium for develop this method, after 3 or 4 years it’s still the most complete system for vehicles and BGE that I know of. I was thinking of using Raiderium’s vehicle physics, but the download site is down. Do the tracks also deform along the wheels too? By the way, good work! Didn’t knew it was down, it’s a shame. yes, the tracks deform, I will try to show it someday in a video. I love it, kind of like World of Tanks as a racer. I’m not sure a real tank would drift that much though. I was thinking of using Raiderium’s vehicle physics, but the download site is down. site is up again and raiderium updated the files. Thanks raiderium. No really big news just tweaks here and there and a rewriting of the engine and gearbox code. Still finishing to accept real life engines specs translating it to real vehicles results more accurately. 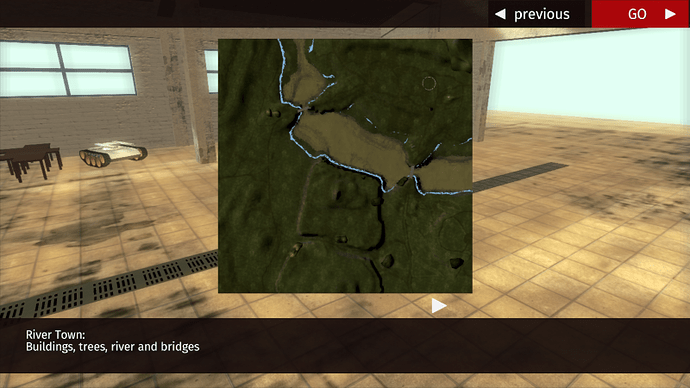 another map still WIP, testing texture splatting and shaders in place of a big texture for the terrain. the one thing missing from this thread is HOW YOU MANAGED TO GET THE TRACKS TO DEFORM WITH THE WHEELS! i mean there is no tutorial anywhere online on how to do this right in the bge. 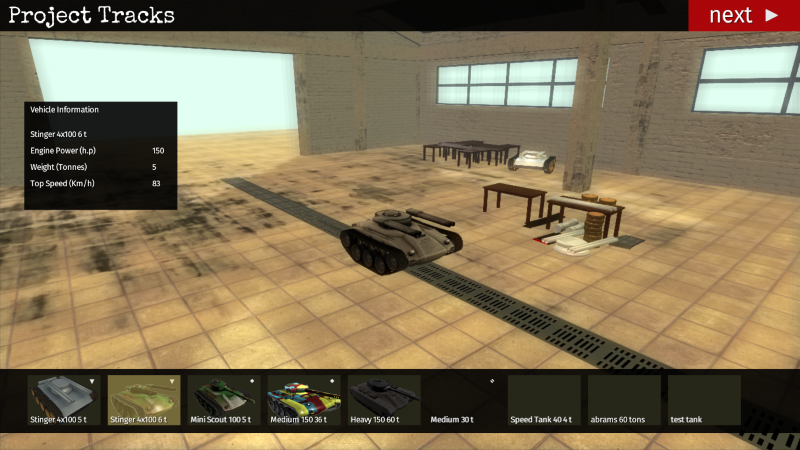 yet here you are with a working prototype that basically showcases battlefield tank physics yet you do no explaining. are the tracks programmed with python? you’re using the ray cast vehicle system, but you have multiple wheels and they all deform the tracks. PLEASE DO A TUTORIAL ON HOW THIS WAS ACHIEVED. Basically, the way you grab the vertices to pin to another object is to add a material to a face with the vertices you want to move and check for other vertices in the mesh that have the same position as those vertices. Then, create a list with those vertices and you can now iterate on that list to, for example, move the vertices. The way you will then move the vertices is up to you, in my case I use the wheels object to get the appropriate material with the vertices I want in the track object and move them along. Here is a small tutorial with the method I used to move the vertices. i cannot for the life of me figure out how to use this blend to replicate the outcome you have because it still is not fully obvious in your explanation. yes i know you are using ray cast for the wheels, idk how to program more than four. yes i do know you are just moving the verts of the track mesh and doing so along on a material but i still have no clue as to how you have it deforming a full track. check the link for raycast method on post 6. Raiderium is the author of that method, it’s very complex, I can’t explain it fully here, from raiderium files you can figure out how to do more than 4 wheels. The way I’m moving the tracks is using the method in the blend file I send with the example, the verts just move up and down along with the wheel , they do not scroll around. For that i’m using a UVscroller. 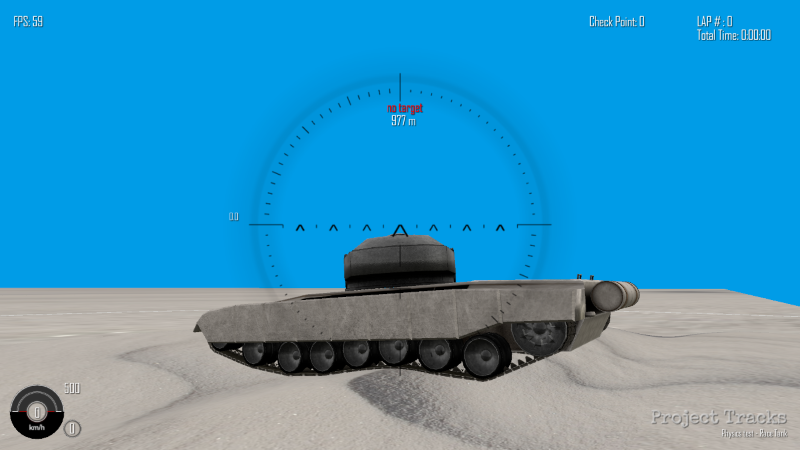 I need to make a rig of tank tracks that automatically move when the tank is moving, automatically turn when tank is turning, stay at the same level as the tank, etc etc etc. Is there any way without a huge python script? smoking_mirror has a post with the code for the uvscroller in there. the track is parented to the tank base and move with the tank base the deformation is done using the pin verts method described. When I have more time I’ll do a proper tutorial with a video, but 1st I want to make a working demo of the project. Until then, I hope this at least gives you some clues on how to do it. okay i got most of that, but still not understanding how to make the link between the wheels themselves and the track with the whole vert pins. i mean the blend you uploaded was just a button making them rise which can be changed on each axis, but the tracks are obviously dependent on the wheels themselves which is what i am trying to figure out.